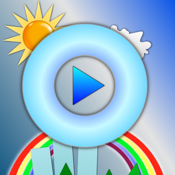 Music Toddler Player is a music player designed for small children. It's easy, intuitive and rewarding for the little ones. Instead of browsing through lists of written words, the child get a simple album view of all the albums appropriate for him. Single click on the album start playing it, a click on a different album switches to that album. Each click is rewarding with the album art expanding on the screen so that the child always know which album is playing. For the more advance kids, a single click on the album art icon that appear on the right top corner of the screen when an album is playing opens up a list of song allowing the child to select it's favoring song. Important: the application doesn't come with any music, it uses your own iPod library music. For the parent: to have the best experience for your child, organized the iPod library on your computer with album arts, setting the genre of the albums appropriate for your child to Children's Music and making sure iTunes matches all the right tracks to the right albums. No need to create playlists. Check the settings of the iPhone to configure the application before your child gets to play with it.